Fusio is an open source API management platform which helps to build and manage RESTful APIs. We think that there is a huge potential in the API economy. Whether you need an API to expose your business functionality, develop One-Page web applications, Mobile-Apps or Microservices. Because of this we think that Fusio is a great tool to build such APIs. If you like the project and want to see it grow please checkout the repository. If you are researching API solutions you probably hear often the term API-Gateway/Proxy and API-Management. Fusio is an API-Management system in the sense that it helps to develop actual API endpoints (which i.e. request and transform data from a database). It is not limited to proxy requests to another API. The following diagram should give you a better overview. Fusio uses the backend services to produce the API response or to handle the request data. A backend service can be i.e. a database, message queue or another API. It is also very easy to implement a custom connection to support any kind of service. Fusio tries to assign the incoming request to a fitting route. The route contains all schema information about the incoming request and outgoing responses. Those schemas are also used at the documentation which is automatically available. 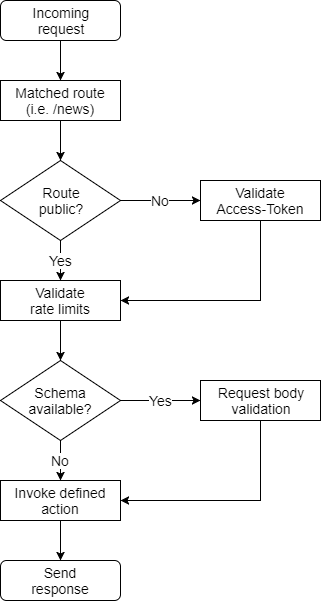 If a request schema was provided the incoming request body gets validated after this schema. In case everything is ok the action which is assigned to the route gets executed. An action represents the code which handles an incoming request and produces a response. Each action can use connections to accomplish this task. A connection uses a library which helps to work with a remote service. I.e. the SQL connection uses the Doctrine DBAL library to work with a database (it returns a Doctrine\DBAL\Connection instance). A connection always returns a fully configured object so you never have to deal with any credentials in an action. Besides that there are already many different actions available which you can use i.e. to create an API based on a database table. With Fusio we want to remove as many layers as possible so that you can work in your action directly with a specific library. Because of this Fusio has no model or entity system like many other frameworks, instead we recommend to write plain SQL in case you work with a relational database. We think that building API endpoints based on models/entities limits the way how you would design a response. You only need to describe the request and response in the JSON schema format. This schema is then the contract of your API endpoint, how you produce this response technically is secondary. Fusio provides the mentioned connections, which help you to create complete customized responses based on complicated SQL queries, message queue inserts or multiple remote HTTP calls. Fusio provides two ways to develop an API. The first way is to build API endpoints only through the backend interface by using all available actions. Through this you can solve already many tasks especially through the usage of the PHP-Sandbox or V8-Processor action. In the code we get the Default-Connection which we have defined previously in our .fusio.yml deploy file. In this case the connection returns a Doctrine\DBAL\ Connection instance but we have already many adapters to connect to different services. Then we simply fire some queries and return the response. Exposing an API of your business functionality is a great way to extend your product. You enable customers to integrate your business value into other applications which gives the possibility to open up for new markets. 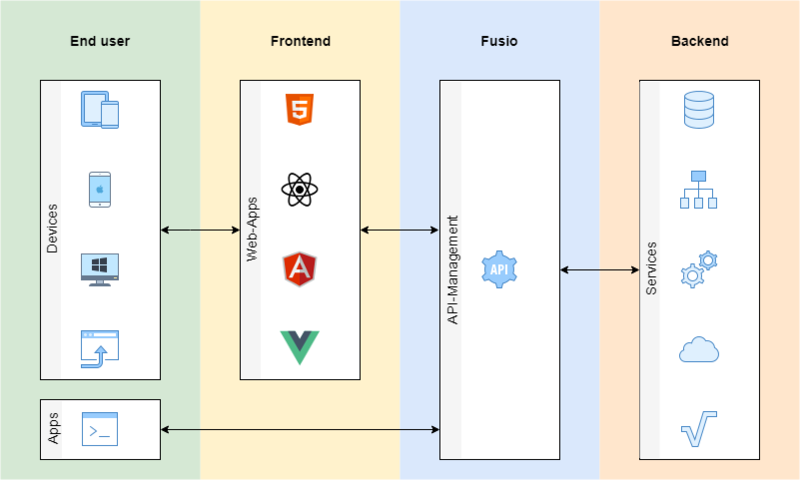 With Fusio you can build such APIs and integrate them seamlessly into your product. We also see many companies which use the API itself as the core product. With Fusio you can simply build small micro services which solve a specific task in a complex system. Almost all mobile apps need some form to interact with a remote service. This is mostly done through REST APIs. With Fusio you can easily build such APIs which can also be used by other applications. Fusio is licensed under the AGPLv3. It is possible to use Fusio for commercial products but if you extend the code of Fusio you are required to license this code also under the AGPL which requires that the source code must be public available. Please contact us regarding other license options. If you are a blogger or magazine we would be happy if you like to cover Fusio. You can download the official icon set to represent Fusio. In case you have any questions please write us a message directly so we can help you to create great content. 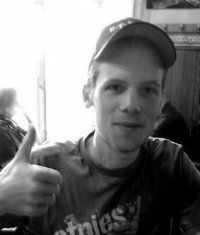 My name is Christoph Kappestein I am a developer, open-source enthusiast and chess player. Talk is cheap show me the code! If you like to contribute to the project please check the contribution guide on GitHub. If you are a company or freelancer and want to get detailed information how you can use Fusio you can contact us for consulting. In the workshop we try to find the best way how you can use/integrate Fusio also we try to explain the functionality and answer your questions. If this project helps you to generate revenue or in general if you like to support the project you can donate any amount through paypal. We like to thank every user who has donated to the project.